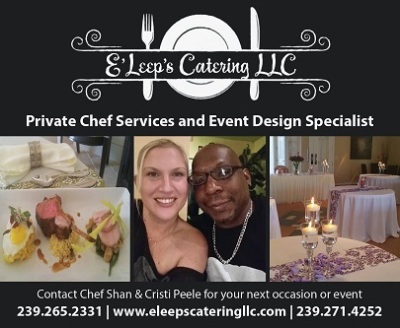 Chef Shan has over 23 years in the culinary arts of cooking multi-cultural hor d oeuvres, cuisines and desserts. 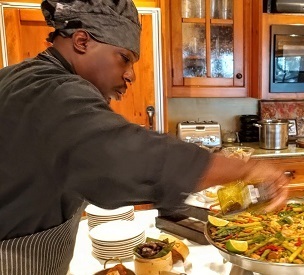 Saucier is one of Chef Shan’s strongest attributes as a Chef. As a Saucier, he learned to combine a variety of seasons, herbs and spices for each of his dishes. Chef creates for his own stocks and sauces using a variety of different meats, bones and vegetables. Everything Chef offers is fresh and authentic. Over the years Chef has worked the east coast from hotels, to fine dinning and country clubs. Cristi his wife was a District Manager for a Corporation for years. Cristi's strengths are accounting, marketing, networking and sales. Cristi works well with people and teams and structures everything she does to be successful. Cristi left her big corporate job, to build her husband and her life dream of serving and event design and planning for her clients. They both feel rewarded equally in the presentation, taste and service of their work.